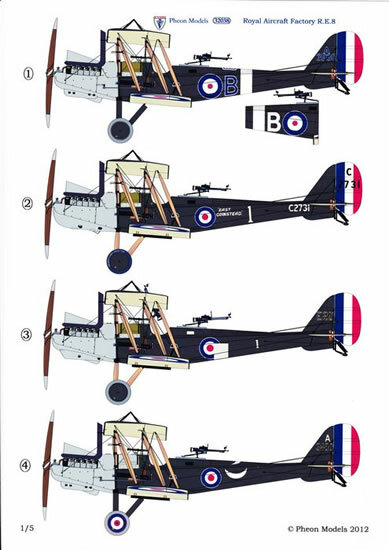 If you want your RE8 to be a bit different, this set provides options with significant history, some with non-RFC/RAF markings and even a non-PC10 finish. Excellent quality package overall. 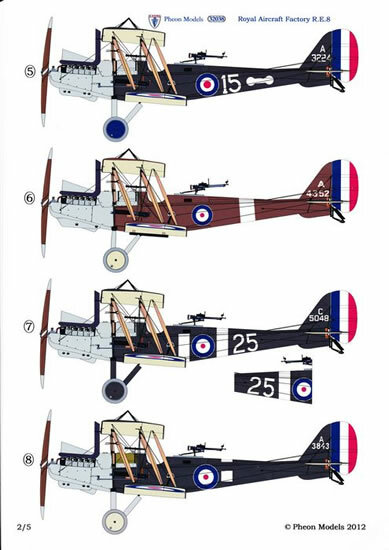 RFC/RAF topics are hard work for an after-market decal manufacturer, compared to other WWI combatants, due to the general lack of personalised markings. One PC10 coloured aircraft looks much like another, right? Within the historical constraints Pheon Models have produced some interesting and relatively colourful options with the release of this set. 1. A3930, “B” 9 Sqn. The Vintage Aviator Ltd finished their RE8 (that was built for the RAF Museum) in these markings, with a white ‘B’. 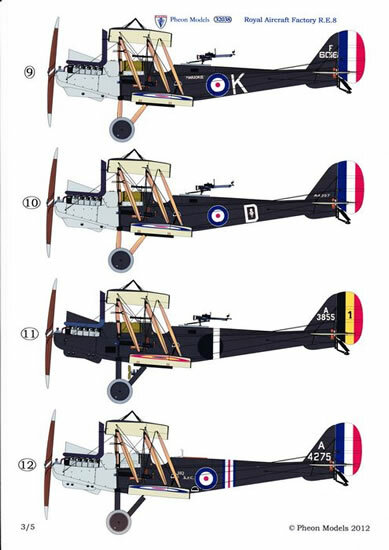 In his book ‘British Aviation Squadron Markings of WWI’ Les Rogers has the ‘B’ in blue with white edging. Pheon have provided both options. 2. C2731, “East Grinstead” 5 Sqn. Has roundels painted on the wheel covers. A crashed RE8 from 59 Squadron features in the WNW instruction booklet. 5. A3224, ‘15’ 21 Sqn. Pheon note in their instruction booklet that a third ‘25’ marking for the top fuselage decking was omitted in error. An additional decal is to be printed and distributed at no cost as soon as can be arranged. At the request of the Australian Government, A.4397 was shipped to Australia after the war, but unfortunately was destroyed in an accidental fire outside the Exhibition Building, Melbourne (where part of the AWM's collection had been temporarily displayed) in 1925. 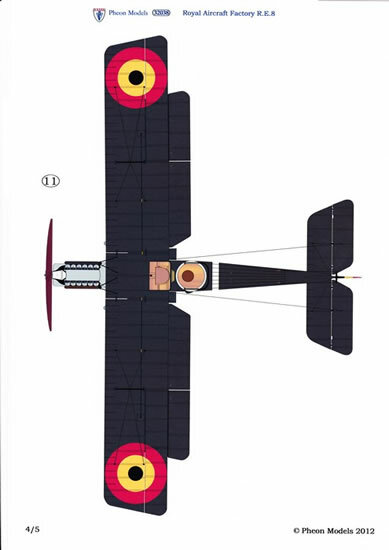 The inclusion of a Belgian aircraft certainly offers modellers are distinctive option with its black/yellow/red national markings. Some modifications to the kit will be necessary to represent this aircraft. It has a large windshield fitted for passenger, the Scarf ring and gun need to be replaced by leather padding and additional foot step added on the lower longeron. Pheon speculate other internal modifications may also have been made such as a wicker seat for the top brass bloke. Centres for the roundels are printed separately to avoid register issues. Rudder stripes and wing roundels are included, presumably to ensure the blue on the fuselage roundels matches the wings (rather than using the kit’s roundels for the wings). The decals come in two sheets, printed by Fantasy Printshop in the UK. There are five pages of colour decal placement guides printed on glossy white card. The instruction booklet is somewhat abbreviated due to the decals being rushed out in time for release at Telford’s Scale Model World 2012. Pheon have promised to provide a more complete booklet to modellers who purchased the set and left their address details with Pheon at the show. Nothing of any significance. More complete instruction booklets will be produced soon. 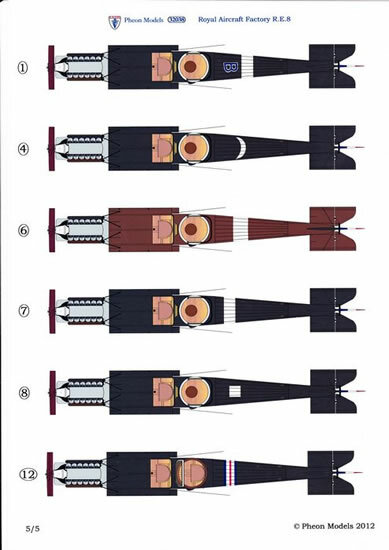 Within the constraints of historical RFC/RAF marking practice, Pheon have produced a decal set with a wide selection of options, some with interesting and colourful markings. Modellers will be able to complete their RE8 models in something different to the kit options.